This week’s show covers September 19 – 26. Miracle babies aren’t much of a miracle. 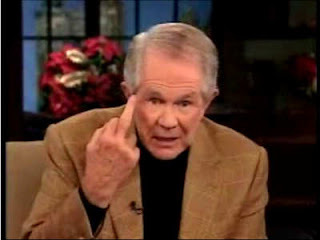 Pat Robertson advocates divorce of Alzheimers patients. Criminals in Alabama can go to church instead of jail. Bad call by an atheist. Pledge of Allegiance petition to take Under God out. Bill O’reilly threatens to quit. President Obama will make guns illegal. Rick Perry and the crazy people who work for him. Syrian girl mutilated. Troy Davis is executed. Ann Coulter is a jackass. Audience boo’s a gay soldier. A teen contributor to “It Gets Better” kills himself. Excommunicated gay Mormon kills himself. Clips Used: Patton Oswalt, 700 club, Jail or Church, Fox News, The Simpsons, Entertainment Tonight, Lou Reed, Jesus Camp and Blue Suade Hooked on a Feeling, News World.